This 8 x 8 building is a fantastic looking unit that benefits from a steel frame construction. The framing provides plenty of strength and durability to the shed and the plastic covering on the outside ensures that rainwater will never be a problem. Integrated skylight and ventilation are just two impressive features this model benefits from. Overall it is an exemplary shed with an attractive design. 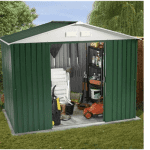 This is a spacious, top quality Storemore metal storage shed, perfect for storing anything from tall spades to workshop equipment. With a gentle sloping apex roof, the shed offers excellent water drainage, reducing the risk of rust and water build-up. It also provides a little extra space inside the building thanks to its slight upside down V-shape. This model measures 2.39m in depth and 2.39m in width, giving it a nice, even design. It reaches 1.86m in height and the double doors measure 1.57m high and 1.56m wide. Unusual for a metal shed, this one comes with an attractive, Shiplap style design. This is a popular style on wooden sheds, though it usually requires yearly maintenance. You don’t need to maintain the metal; it can take perfectly good care of itself. So the cladding is more for show than it is for construction benefits. We were really impressed by the hot dipped galvanised steel frame. Providing superb overall strength, the frame can withstand a lot of pressure. So the cladding and framing impressed us but what about the floor? Well there isn’t one so this does need to be built on an even surface such as paving slabs, concrete or timber decking. 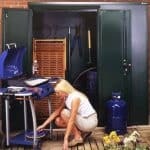 As no treatments are required, no extra money will need to be spent on the shed once you’ve assembled it. This is a very large benefit as it adds to the buildings exceptional value for money. There is also a very impressive 10 year anti-rust warranty. 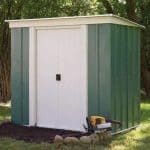 So if you’re looking for a low maintenance shed that will provide you with great peace of mind, this is a great one to opt for. With wide, large double doors, you are provided extremely easy access into this spacious shed. They can also be padlocked, though keep in mind that the padlock doesn’t come included. One feature we like with this model is its windowless design. While it may not provide any lighting in the shed, it does provide complete privacy. Therefore we recommend this if you’re hoping to keep your stored belongings out of view. As mentioned, the shed doesn’t come with windows so you do benefit from a fantastic private design. This makes it a good choice for storing expensive tools and machinery. Just one extra is offered with this metal shed and that’s an anchor kit. This can be used to secure the frame of the shed securely onto the base. As mentioned earlier, you can only install this building on top of concrete or something similar such as paving slabs. Without a floor, the frame of the shed isn’t completely grounded. While technically this shouldn’t be a problem due to how heavy the metal is, the anchor kit can still help to give you peace of mind. Within the kit you’ll find screws that need to be inserted into the base rail holes. They are easy to screw in and will last until you decide you want to take them out. 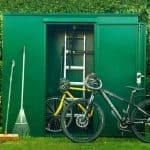 We do highly recommend this upgrade as it isn’t expensive yet it can help to ensure your shed stays firmly in place, increasing its overall stability. We give this a definite 10/10 rating for quality. 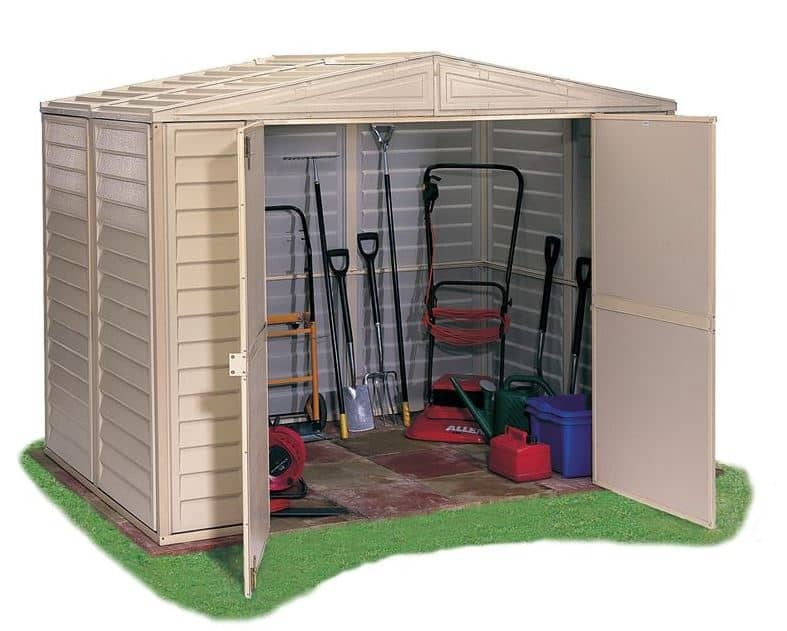 All sheds in the Yardmaster range have an excellent quality construction that is both reliable and impeccably durable. You would expect a shed that comes at such a low cost to be pretty flimsy and prone to damage. However, this shed certainly can’t be described as weak. Its materials will last 10 years minimum thanks to the galvanised steel frame. 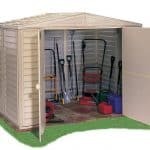 The shed gives you a great amount of space to store any gardening equipment or tools. It should provide plenty of space for the majority of households and won’t take up too much room in the garden. 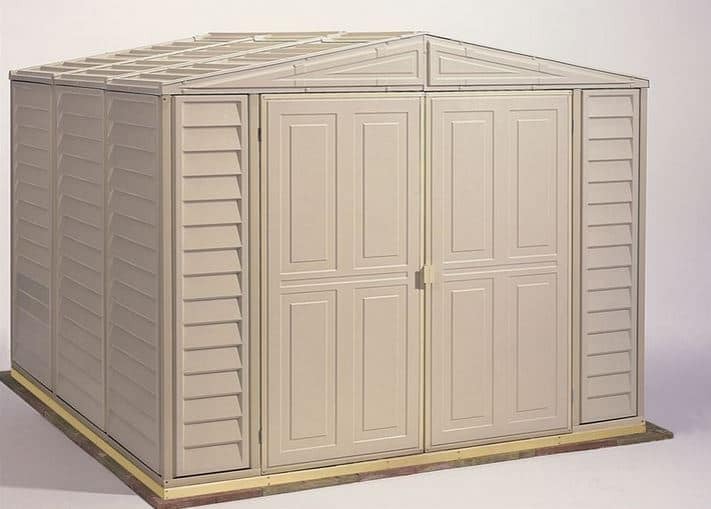 We advise setting aside at least half a day to assemble this shed. It’s not difficult to assemble, it is just time consuming. As you’d expect from hot dipped galvanised steel, the panels aren’t overly light. 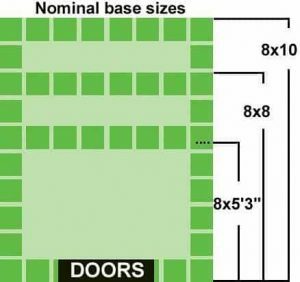 So you do need to have two people assembling the building to ensure adequate safety. 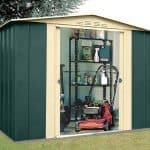 They say you typically get what you pay for but Walton’s have blown that theory out of the water with this affordable shed. Despite having such a low price, it provides outstanding longevity along with excellent features and needs zero maintenance. If that’s not good value we don’t know what is. Final Thoughts: As usual, we loved the design of this Yardmaster shed. We always find buildings in this range to be some of the highest quality and long lasting sheds on the market. 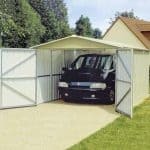 It is especially ideal for those looking for a good level of storage space whilst sticking to a budget. One of the main things we like about this shed is the fact it can accommodate heavy machinery or tools.